As a part of my job I travel a lot and whilst travelling I'm normally on the go running from a meeting to an event to a social thing so it's important to me that I have multi use products in my bag that I can use while I'm on the go, these products are really handy to have in your beauty cupboard at all times just in case. There's no other way to but it, this balm is LUSH, it's a thick butter like consistency that can be used on grazes, dry skin, chapped lips, blemishes, sore muscles and sunburn. For you fellas out there the balm can also be used after shaving to help soothe any irritation, it is also safe enough to use on babies. 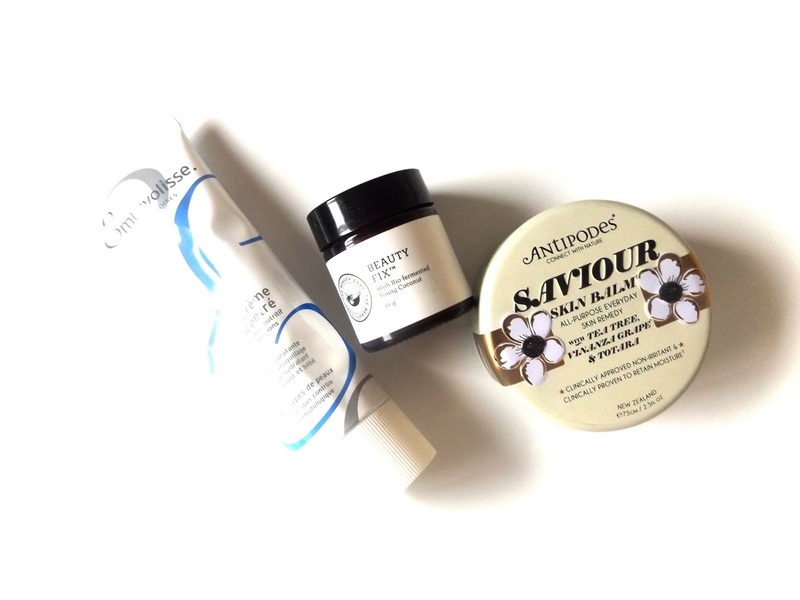 The thing I use this balm most for is chapped lips, I also love using it around any dry areas around my face like my nose and even under my eyes on a long haul flight. It contains antibacterial and anti fungal properties with Totara, Australia Tea Tree, Echinacea and Vinanza Grape which helps with cell and skin repair. The Beauty Chef is a brand that has been on my radar for quite some time now, they create products for inner and outer health and I have had some great results from the inner beauty powders. I have recently added the Beauty Fix Balm into my routine. The product has a balmy type consistency to it but once you touch the product it instantly melts into an oil, I like using this balm especially on any problem areas on my skin like blemishes and dry patches. It definitely came in handy after my long haul flight last week! The balm contains ingredients that help to heal damaged skin, smooth lines and wrinkles, soothes inflamed skin, hydrates and retexturises, restores the lipid balance and protects from from environmental assault. This product has been a cult product with beauty junkies and make up artists for years, I constantly hear makeup artists talk about how much they love this product. Essentially it's a rich moisturiser that hydrates the skin but also forms a really great base for makeup application. If your in a real pinch the product can also be used as a cleanser, I like to apply mine like you would a balm cleanser with dry hands to a dry face then either remove with a flannel or emulsify and rinse with warm water. It works really well at removing makeup whilst cleansing the skin and because it's meant to be a moisturiser it remains quite hydrating on the skin. Click Here For Stockist Information.